Union Assurance (UA) walked away with two prestigious awards at the recently concluded SAFA Awards ceremony for financial reporting in the South Asian region. The winners were selected through stringent selection criteria with an eminent panel of judges from the region. Award winners were selected objectively, and the selection criteria itself was based on the presentation and disclosure of high quality, relevant and reliable financial and non-financial information. It is the 6thconsecutive year UA has been recognized at the SAFA awards, further strengthening the company's commitment to enhance transparency, good governance and adequate disclosures to satisfy varied expectations of diverse stakeholders. UA was presented with the 1st runner-up award in recognition for its efforts to present high quality financial statements while also being awarded 2nd runner-up for Corporate Governance Disclosures. 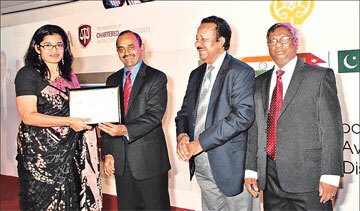 It is important to note that UA was the only insurer in the region to have bagged two awards this year as well. Good governance and transparency are the main pillars of UA's operating model. The company has also adopted a code of best practice issued jointly by the Institute of Chartered Accountants of Sri Lanka and the Securities and Exchange Commission of Sri Lanka as well as Corporate Governance rules as per the listing rules of the Colombo Stock Exchange. "For UA, transparency and good governance is a journey and not a destination. We will continue to embark on our journey of achieving excellence by providing relevant, reliable and objective information to be the most transparent corporate citizen in the country", said Ms. Sherin Cader - General Manager Finance and planning. It is important to note that UA was recognized at the recently concluded Annual Report Awards ceremony conducted by the Institute of Chartered Accountants of Sri Lanka. UA triumphed in 3 main categories, achieving a Silver award for Overall Excellence in Financial Reporting, a Gold award in the Insurance sector and adjudged Joint winner for Corporate Governance Disclosures. In recognition of UA's business practices in the insurance sector, the company secured a Silver Award at the National Business Excellence Awards 2012, conducted by the National Chamber of Commerce of Sri Lanka (NCCSL) for the 5th consecutive year. UA's combined life and general gross written premiums increased to Rs. 9.7 billion achieving a 12% growth from the previous year. Life insurance premiums increased by 14%, to Rs. 5.1 billion for the year 2012. Non-life insurance premiums contributed Rs. 4.6 billion to the combined turnover with a 9% growth, while maintaining disciplined underwriting practices. Both retail and corporate distribution channels maintained steady momentum in business volumes in achieving this growth and were able to leverage the professionalism of the distribution and technical teams as well as reinforce its reputation as a trusted service provider completing 25 years of operations.